I suspect I’m not the only one who doesn’t really care for real-life fishing, but still loves fishing games. Usually I like them best as a relaxing, little, minigame diversion, instead of the meat and potatoes of the action, but my recent dip into Gameloft’s Fishing Kings may force me to rethink that opinion. Fishing Kings is a full-on fishing simulator, plain and simple, and not the idyllic fantasy-type fishing with a stick and a hook. This is modern-day sport fishing, complete with carbon steel rods, fancy lures, and big ol’ boats. You can fish in a number of gorgeous and exotic locations, including New Zealand and the Bahamas, and you win prize money or unlock new equipment and locations by winning tournaments. The menu has a few different functions in the game. “Tackle” lets you customize your rod, reel, line, and lure to best suit the fish you’re after, and over time, you can earn “fishbucks” to upgrade all of your equipment. “Diary” keeps track of all your stats and leaderboard status, and “Guide” gives you insights into all the scaly aquatic life you encounter. There’s also a “PDA” (dated much?) to help you stay on top of missions and tournaments. The game mechanics are surprisingly robust. In landscape mode, you flick to cast, and once you’ve managed to attract a fish, you jerk to hook it and then you engage in the careful dance of reeling the fish in while keeping an eye on the line tension. A little gauge in the corner lets you know which direction to tilt the iPhone to keep the fish from breaking the line. It can be really difficult to keep adjusting your position while also trying to reel the line in with touchscreen, but after a few broken lines and a lot of practice, it definitely makes for a more realistic and very satisfying challenge. In addition to the very solid gameplay, the graphics are fantastic, complete with super detailed fish and refreshing locations. The underwater view is especially gorgeous, with plenty of aquatic atmosphere to keep the eye engaged while you’re trying to attract a stubborn trout. There’s not a whole lot of customization for the fishermen, and the music and sound effects are a little too honky tonk for my taste, but the quality is very high. I didn’t love Gameloft’s personal leaderboard set-up, but that’s largely because I already deal with tons of games that already deal with Open Feint, Plus+, Crystal SDK, etc. The Apple Game Center will almost certainly change all of this in the future, but for now, any online support is nice, especially for a game that’s all about bragging about who caught the biggest fish. Long story short, this is a really good fishing sim, delivering hours of satisfying gameplay for a very reasonable price. Even if you’re not a huge fishing game fan, Fishing Kings is remarkably attractive, fun, and totally worth it. 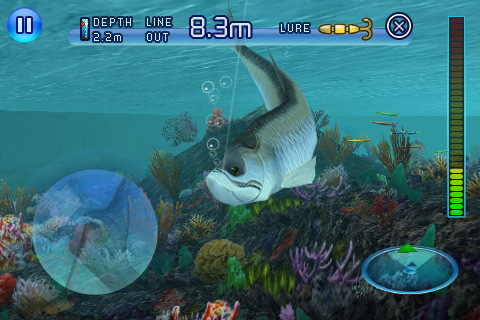 AppSafari review of Fishing Kings was written by Tracy Yonemoto on May 11th, 2010 and categorized under Action, App Store, Featured, Fun, Games, Sports. Page viewed 6365 times, 2 so far today. Need help on using these apps? Please read the Help Page.